Pro-Cut High Profile Hip & Ridge featuring Scotchgard™ Protector shingles provide "peak" performance in hip and ridge protection for both sunbelt and snow-belt climates. Atlas Pro-Cut High Profile's flexible design eliminates the need for hand bending, undue flexing, opening or closing of the shingle. Simply remove each shingle unit from the carton and place on ridge as-is. 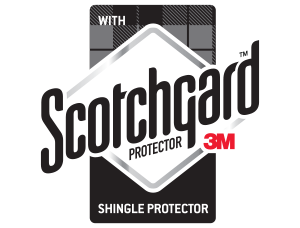 The Pro-Cut High Profile Hip & Ridge featuring Scotchgard™ Protector shingle is pre-cut to save time on the roof and offer a more consistent job every time. It features a 8-1/4" exposure. The Pro-Cut High Profile Hip & Ridge featuring Scotchgard™ Protector shingle has a SBS-modified seal-down strip for high wind performance, long life and easier installation in cold weather. Pro-Cut High Profile Hip & Ridge featuring Scotchgard™ Protector colors are available to match popular StormMaster® Shake, StormMaster® Slate, Pinnacle® Pristine and ProLam™ shingle colors. *In order to qualify for the Atlas Lifetime Algae Resistance Limited Warranty against black streaks caused by blue-green algae, installation must include Atlas Pro-Cut Hip & Ridge shingles featuring Scotchgard™ Protector or Atlas Pro-Cut High Profile Hip & Ridge shingles featuring Scotchgard™ Protector with Atlas shingles featuring Scotchgard™ Protector. Atlas Pro-Cut High Profile?s flexible design eliminates the need for hand bending, undue flexing, opening or closing of the shingle. Simply remove each shingle unit from the carton and place on ridge as-is. Follow installation instructions as shown below.